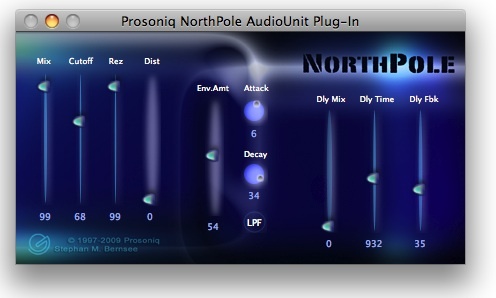 NorthPole is a free effects plug in for AudioUnit compatible applications on the Macintosh. It adds a fully programmable virtual analog synthesizer filter with resonance, envelope follower and an integrated post-filter digital delay to your audio production environment. This free plug in equips your AudioUnit environment with a fully programmable resonant filter. In short, you can send any of your audio tracks through this ‘virtual analog’ effects device to either create spezial effects or to simulate the behaviour of an analog 4-pole synthesizer filter. Posted by herbalizer on Sat, 04/09/2011 - 06:12. This filter sounds absolutely beautiful. Smooth as a cashmere cod-piece some might say. Distortion and delay features useful especially having tap input available for the delay-time. 10/10.